Various flavoring methods are used by our artisan producers to deliver the best tasting olive oils, and unlike alternative products, ours use 100% Extra Virgin Olive Oil. Il pont herbal infused olive oils include Chilli, Garlic, Truffles, Tuscan Herbs, and Basil to name a few. A few of our citrus olive oils include Lemon, Orange and Lime. 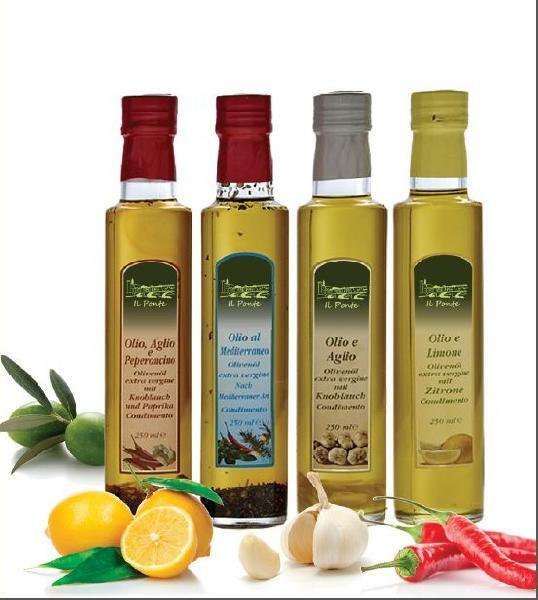 Our Tuscan Herb Olive Oil is an amazing proprietary blend of herbs including Oregano, Basil, Garlic, and Rosemary. It is one of our top sellers! This flavourful oil is to season meats, vegetables, pasta, salads etc.